After wonderful days in Istanbul it did us good to be back in the nature. For Sam there had been a bit too much going on with many people and impressions in this huge city. 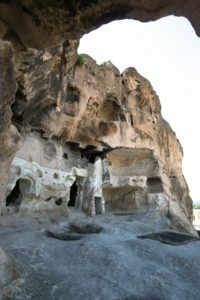 We were not sure which way to Cappadocia we wanted to take and while researching we stumbled across the Phrygian Valley. It sounded promising and seemed to offer culture, an old history and ancient ruins. Thus we decided to cycle through the region South of Ankara. Sam was still a bit under the weather, being tired as he wasn’t able to get enough sleep in Istanbul and suffering from a light diarrhoea. We had planned to cycle straight to the valley but Samuel was rather tired and didn’t really feel motivated at all. At the same time there wasn’t a feasible place to stop and take a rest. 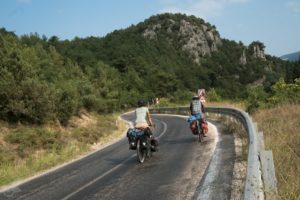 On the third day we cycled through the small city of Bilecik and wanted to buy some groceries, when suddenly a young man approached us. He had seen us passing by and invited us to stay with him. 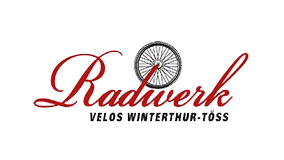 He often hosts cyclists and would love to welcome us as well. Samuel and him were both surprised to find out that they shared the same hometown (Winterthur, Switzerland) and were even born in the same year and month. Our host Hakan was born in Winterthur and lived there for the first three years of his life and Samuel has lived there for the past ten years. It was wonderful to have this unexpected break and Hakan told us a lot about his city Bilecik – thank you very much! Our accomodation was an old and small football stadium, very unique and different from our former sleeping places. Further into the hills we reached the Phrygian Valley. It was a real hidden gem as it has hardly seen any tourists and was captivating because of its simple beauty and calm atmosphere which made it a highlight of our journey so far. The beautiful nature features many hills, some gentle ones and others lined with steep rocks. At times small and bushy trees are growing in the otherwise sparse and dry landscape. Everything is in earthly colours of yellow and brown. And in the middle of this nature time and again the old homes of the Phrygians carved in rock are to be found. 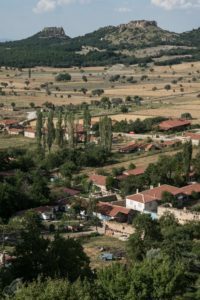 We stayed at the Midas Han camping in Çukurca in the midst of the valley for two days. The camping was very well maintained and cozy and came with the option of staying in the big house as a hotel or hostel as well. What remains of the Phrygian culture amazed us often and led us to picture their way of life. How did they manage to carve those many big and small buildings out of rock about 4000 years ago? Unfortunately much of it has eroded and one can only use their phantasy to imagine how it must have look in all its splendour. Our journey led us out of the Phrygian Valley towards the East of Turkey with our next destination of Göreme in Cappadocia. We have spent six days on the road and cycled through a big plain around Konya. The area has a lot of industrial agriculture and some non-descript small villages. Especially when there are only small villages in our path we use the opportunity to buy our provisions in the shops we find there. This sometimes turned out to be more difficult than we thought wich meant that we had to search through all of them to find everything we needed. But at least we could support different local shopowners this way. At times the roles changed – for example once the elderly lady shop owner didn’t let us go without providing us with a proper breakfast which she more or less forced us to eat right there at the counter. Unfortunately we could hardly communicate with her because my (Julia’s) Turkish is still not sufficient for real conversations. In the end she refused to take any money for the breakfast and also gave us quite a discount on our purchase. Another touching encounter took plave with three farmers who live in a village we set up camp next to. Early in the evening three boys appeared and watched us in awe how we set up our camp and cooked. When it was already dark and we were about to retire into our tent a farmer and his two younger relatives took their place. Equipped with smartphones and google translator we asked and answered questions back and forth. It was wonderful to share mutual interest in one another. Aside from these two very special encounters we have often been approached or invited for a çay (tea) last week. Often we had to refuse their kind offers as we had to cover at least some distance with our bicycles – but if we have the opportunity and time we gladly accept and often they turn into fascinating encounters.